With a shopper’s instincts governed more by impulse than need, the last thing a retailer wants to show their customers is an ‘Out of Stock’ notification. The crushing weight of demand during the Black Friday frenzy can break the backs and quash the systems of any retailer, whether online or offline. Arriving on the 23rd of November this year, Black Friday marks the beginning of holiday shopping season across major countries. Black Friday sales have doubled in the span of past two decades, amounting for over $720 billion. As per Forbes, retailers earn 30 to 40% of their annual revenue in just the four-day weekend. Many years ago, the Friday following Thanksgiving Thursday was just an unofficial leave for most people which also meant a small vacation over the extended weekend. Shopping on Black Friday caught up as a trend in the late 80’s when retailers started offering discounted merchandise to cover their losses and make some extra bucks. An average annual increase of 3.5 percent in sales over the last decade on Black Friday has impelled companies to come up with innovative tactics of closing maximum sales. To seize the opportunity, brands are making an advance towards adopting IoT based solutions to power data-driven decision making. 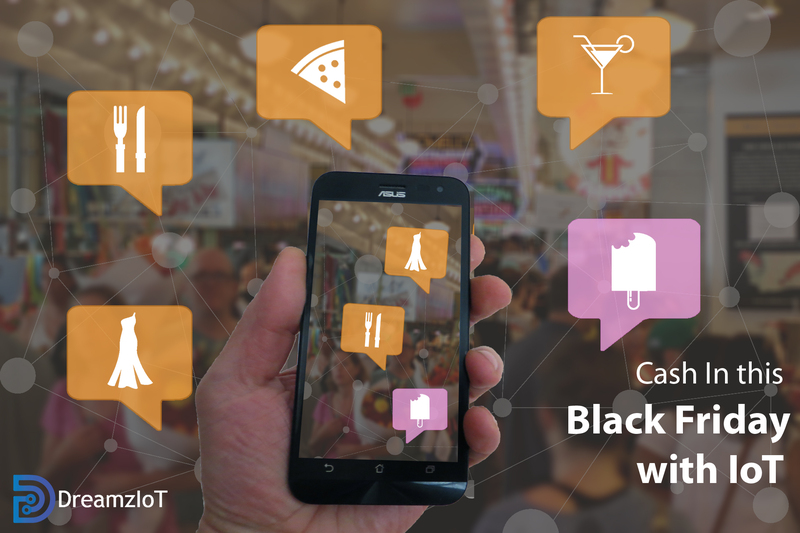 To better understand IoT and its impacts on retail sales at any time of the year, particularly the busiest season such as Black Friday, imagine a world where almost anything can be connected transforming the world into a big information system. The system can gather and analyze information to learn from the tasks and processes to provide more contextualized insights and a plan for responsive interactions with devices and humans. IoT is steadily permeating into our everyday lives which is already filled with multiple smart devices, often within an arms reach. The common objective between all the early adopters of IoT is to provide a highly personalized shopping experience. A great example is set by Home Depot for its privilege customers who can use an app to find the in-store directions to products they browsed online earlier. Anyone who’s been to a Home Depot certainly knows those places are no less than a maze! Here are few of the many ways in which retailers across industries are using IoT to improve their customers’ shopping experience. An IoT enabled supply chain can allow you to maintain an intelligent inventory which is concerned with more than just units and measures. Monitoring essential details using RFID beacons and tags – such as expiry date, temperature, demand etc – can take you a long way by preventing wastage as well as a shortage. The impact of an efficient inventory system reflects positively on the overall customer satisfaction levels. Long lines at the checkout can make customers drop items from their shopping cart or just exit as soon as they enter. IoT can help tackle the employee crunch during rush hours by completely doing away with human intervention by embedding the stores with cameras and sensors paired. Amazon Go, now present in 6 locations in the US, deducts the amount of purchase from customer’s accounts after they walk out. Similar trends can also be seen catching up in China, too. Data gathered from different sources present in the target audience’s environment provides greater insight into the buying behavior and preferences of the customers. Sellers can design a highly personalized experience via better products and innovative promotional methods, giving a boost to brand loyalty. The basic shipment tracking feature allowed by most eCommerce companies these days can be stepped up with the intervention of IoT. Connecting GPS with IoT can enable highly detailed tracking of shipments through sensors, especially when transporting fragile or perishable commodities. Smart geo-tracking is highly desired by both supply chain managers and customers who wish to manage things more closely. A closer look at your customer’s movements and actions can provide you with great insights into their mindset and habits. Observing recent purchases, cart additions, movement from one section to another can help design a more satisfying shopping experience. A host of devices such as mobile phones, RFID beacons, or sensors installed in the shopping carts are being actively used by companies. SMS marketing, which has now escalated to Whatsapp and Facebook Messenger, is notorious for pesky and irrelevant notifications popping up every now and then. Through geofencing, retailers can send relevant promotional messages to a target group of an audience using RFID or Wi-Fi networks as they enter a specified geographical location, making messaging all the more effective and successful. Macy’s, Urban Outfitters, and Timberland are some of the stores that started using the beacon technology as early as 2014. IoT enabled instruments such as sensors, subscriptions, beacons, etc are transforming how businesses reach out to customers. Using a unified solid data foundation, generated via multiple IoT sources, can help you offer a uniform experience across all channels to your customers. Having robot employees in large stores can help reduce the burden on human resources who can work on providing better customer assistance. Stores such as Lowe’s and Target are using robots to help customers find products and help with inventory management. Having all the products you need under one roof is great but sometimes it gets too overwhelming. Retail stores can use infrared sensors and analytics software to find out whether the present layout needs changes or not. You don’t want to make your customers wade through aisles of unwanted products in order to find what they need. In conclusion to all the different innovative solutions discussed above, it will be fair to say that Internet of Things enables us to do things more efficiently, saving time, money, and also reducing emissions in the process most of the times. IoT is the junction where online and offline retail experience can join hands. Real-time communication between warehouses, distributors, retail outlets, and consumer’s mobile devices is imperative to respond indomitably to the Black Friday rush. With fast evolving consumer behaviors, it’s crucial for the brains behind the products to think of a holistic approach – a truly omni-channel experience where customers can access both services and support seamlessly. A whole new class of products like in-store analysis devices, industrial grade sensors, interconnected manufacturing machines, and workspace management solutions is readily available in the market for retailers to explore.